Was the 20th Century a Period of Progress? 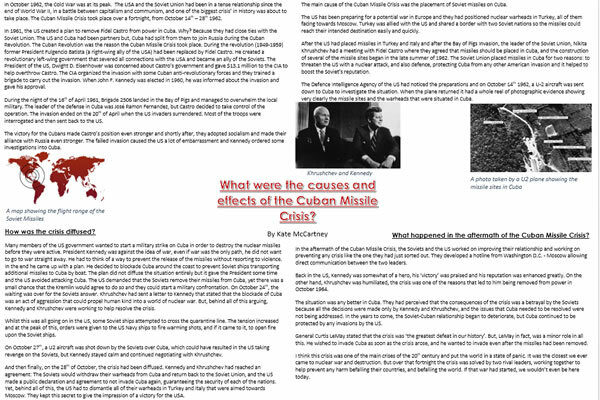 This project is designed to allow students to develop a broad but comprehensive overview of the main events of the 20th Century. Each student will research one key event, theme or individual of their choice to produce an attractive display piece. They will compare and contrast their findings with other people in the class to answer the question "Was the 20th Century a period of progress?". This is a new project that I developed in order to provide my students with a "study through time" after the depth studies of the Year 9 syllabus. It also provides an excellent overview of 20th Century History prior to starting the IGCSE Modern World History course. 1. What do students know already? • Pre-Class Preparation: the teacher should divide the board into 10 rows to represent the decades of the 20th Century (alternatively, this can be drawn onto sugar paper and laid on the floor, which makes it easier for students to place pieces of paper onto it in the main activity). • Organise the class into teams of 3-4 students. Give each team a couple of sheets of coloured A4 paper (note: different colours for each team!). •Each team should cut start cutting their sheets into slips. Onto each slip should be written a year, and a 20th-Century event (note: they can omit the date if they have to, and should aim in this case to simply write the decade). • As each slip is finished, it should be brought to the front of the class and added to the growing timeline provided by the teacher at the start of the lesson. • Note: each event can only be used once; so if a team tries to add a slip for an event already on the timeline, they have missed their chance and it has to be left aside. • When the teams have run out of ideas (or time runs out), the teacher reads through the completed timeline with the class, correcting any mistakes / re-ordering any slips as appropriate. • Teams gain one point for each event they identify, and two further points if they identified the correct year of the event (but only one point if they were merely in the correct decade). • Add up the scores for each team (which should be easy as each team used different coloured paper for their slips) and then make some closing observations (is the class more knowledgeable about particular periods / places than others? Why?). 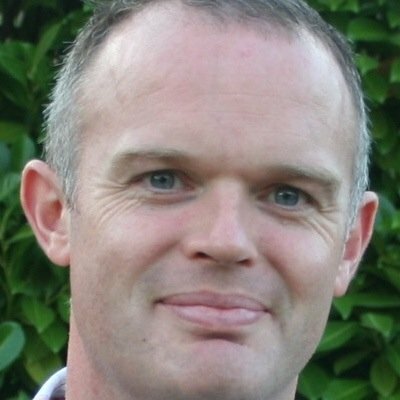 • The Excel Timeline allows the teacher to talk through the century in three broad 'chapters'. This talk can take between 15 minutes and half and hour and it's best if the teacher can throw in some questions and discussion points as they go along. • At the end of each 'chapter' of this three-part story, the teacher should pause to provide students with time to make their own notes ("Task 1" in the spreadsheet). • After a period of time devoted to research, two teams will each suggest what they think is the most imporant event in a random decade chosen by the teacher. They will aim to persuade the rest of the class that their choice is the 'most significant' one. After everyone in the class has developed their timeline with a choice of one of these two events, a vote will take place to decide who wins the point for that round. In the next round another pair of teams, and another decade, will be selected. Students take notes in their timeline as the competition proceeds. Merits should be awarded to the winning team at the end of the game. • Organise the class into four teams. • Each team needs to agree upon the most significant historical events for each decade of the 20th Century (no more than one per year). How they decide to approach this task is up to the team to decide. • Before they start their research, discuss how historians measure "significance" - guide them towards the idea that they should think in terms of who, where, and when was affected: the most important events affect a large amount of people (=who), over a wide area (=where), both in the short and the long term (=when). • Students then divide the task among the team members, using books and websites to conduct their research. TIP 1: Encourage students to be creative with their web searches (e.g. "20th Century Timeline" is pretty unwieldy. "Key events of the 1920s" is better. "Most important scientific discoveries of the 1940s" is even more focused (and so on). TIP 2: It's best not to simply divide the timeline into 'chunks' and allocate one to each student in the team - this will not allow for any comparison and discussion in the team about the 'best' events to go forward to the competition. TIP 3: Encourage students to focus on a range of themes in a range of places (e.g. cultural as well as political events; women's history; black history; events outside of Europe...). Students should record their findings in their own individual copies of the Excel Timeline. • Each team should spend some time comparing their choices with each other and developing their Excel Timeline as appropriate. To ensure that all students complete their timelines individually, tell them that in the competition round the teacher may demand that the chosen event for each decade might need to be provided by one named student in the team, without any conferring. • The teacher starts with the 1900s. • The first two teams each have to volunteer a key event in that decade and explain why it deserves to be regarded as 'important'. • Everyone else in the class act as judges and vote for a winner after students have all individually developed their own timeline with their personal choice. • The next round should involve the third and fourth teams; repeat this format for as many 'rounds' as desired. • Bonus points can be awarded to any teams which anticipated an event included in the Teacher Version of the Excel Timeline. • The teacher could nominate a particular person in each team to answer the question without conferring. 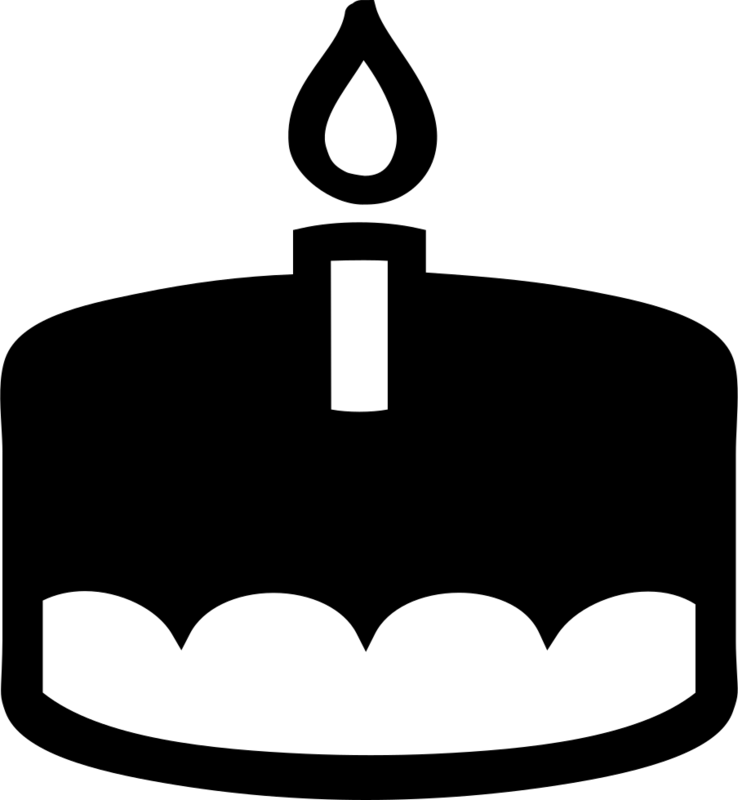 • Instead of specifying a decade, the teacher could instead demand an event relating to a particular theme (e.g. women's history) or place (e.g. Africa). 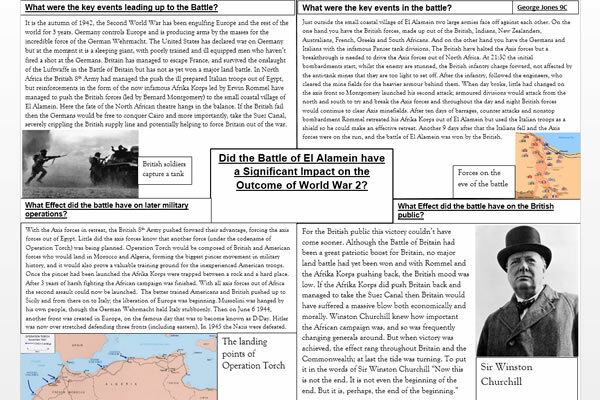 • The 'teacher timeline' could be shown after each decade has been discussed, and students can award themselves individual points for each of these events that they included in their own timelines. 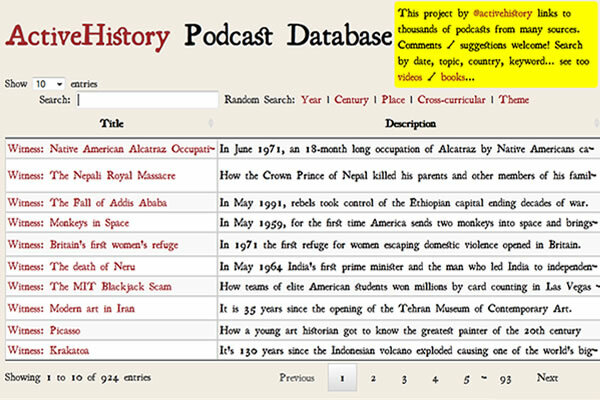 • Students are provided with the interactive database of links to BBC "Witness" podcasts (each one lasts only 10m). • Students then share their choices with the rest of the class. 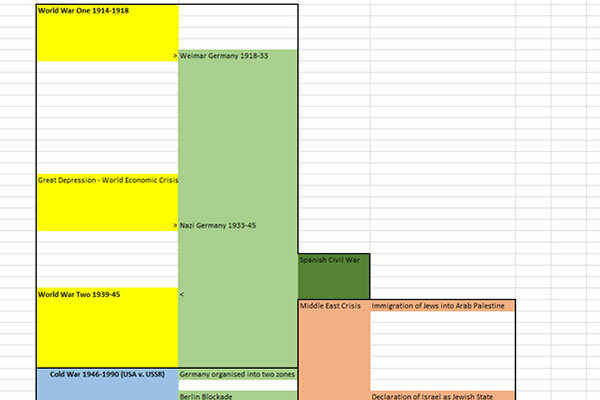 Students develop their Excel Timeline as appropriate with reference to these new events. • Each member of the class then decides upon two podcasts to listen to from anywhere in the spreadsheet. • They listen to these for homework, and should make some notes ready to discuss with the class upon their return. 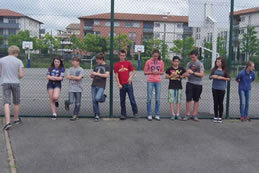 • Students are arranged into pairs. • They tell each other what they learned from their podcasts. • Each student develops their Excel Timeline as appropriate. • Next, get random people in the class to stand up to explain to the rest of the class what they learned from their partner (note: this is a very effective way to ensure that they listen carefully during the paired discussion phase, and do not talk for too long at this stage - as they have had limited time to exchange views). • The other students in the class develop their timelines as appropriate. • Discussion point at the end of this process - if you were to listen to one more podcast based on what you have heard, which would you choose and why? This document provides an overview of the 20th Century through feature films. Students can read through the story and, if any films overlap an area of their interest, they can research it further (and even borrow it from the school library to watch!). There is also the ActiveHistory interactive database of historically-based feature films to watch. Students formulate one question based on one key event, personality or theme of historical significance in the 20th century. How was the atomic bomb invented? How did the Americans justify its use in Japan? What were its effects on the Japanese people? In what ways has its use been criticised? With the questions decided, students need to arrange their research into a one-sided display piece. The key question can be placed centrally, with the other questions arranged around it (see sample image shown here). An alternative approach is to have the questions listed on one side, with an associated image underneath; the actual answers can be on the reverse of the sheet. At this stage, everyone goes outside into the playground and the students have to organise themselves in a continuum line, with the most 'positive' event to the left, and the most 'negative' event to the right. This can involve a lot of discussion. As they start to settle into their positions, give them the next task to keep them talking: namely, each person will have to briefly describe not just why their event is best described as 'negative' or 'positive', but also why it is MORE positive than the event described on one side, and LESS positive than the event described on the other! The two 'ends' of the line then come towards each other so that the 'line' turns into a circle, with the teacher in the middle. At this point the teacher flips a coin. "Heads" means that the talk will go from most positive > most negative. "Tails" means it will go from most negative > most positive. The challenge is then to talk to the camera without hesitation or too many stumbles! The following video gives an example of how this might work (I noted afterwards that many students decided where to place themselves in the continuum using the criteria of 'how many people died' as a result of the event...next time I will remind them of the "Who / When / Where" approach to measuring significance to help them be more varied - the most important events affect a large amount of people (=who), over a wide area (=where), both in the short and the long term (=when). Arrange the class into four groups. Give each student a sheet of paper to divide into two columns to highlight positives and negatives (see sample image). Each person in the team starts by writing the name / date of their event into the appropriate column, with a brief explanation. Some events of course could be split between both columns - this is fine as long as it is explained clearly in each column. Then each person in the group takes their turn to explain their event to the rest of the group. Everyone else in the group makes notes as appropriate. Repeat until everyone has spoken and each member of the group has a detailed set of notes. Give each person in the first group a different letter (A, B, C, D). Do the same for the people in other groups. Then create new groups based on these letters and repeat the process outlined above. 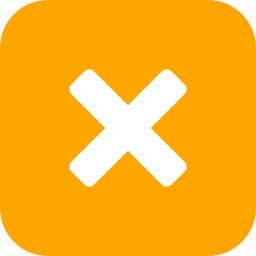 If extra time is available, each person in the group can also talk about some of the other events covered by other people in their original team. 11. 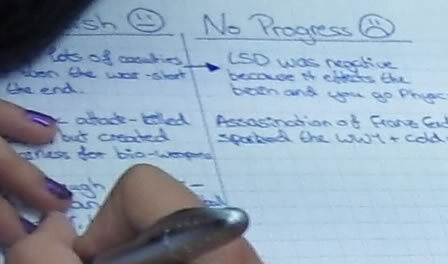 Essay Writing Phase: Was the 20th Century a Period of Progress? Students are now in a position to write their essay on the key question "Was the 20th Century a Period of Progress?". In the simplest way, they can write the essay in two main sections: positives and negatives. A more sophisticated approach could arrange ideas in a table like this before writing up the findings. Where? Which particular countries / continents / places? What? Which area of life (e.g. science/technology, culture/arts; politics, economy)? The detailed ActiveHistory rubric / markscheme for History Projects is very useful at this stage; also available is a custom-made markscheme for this project.